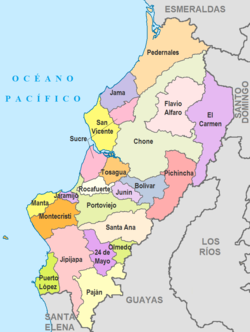 Location of Manabí Province in Ecuador. Manabí is a province in Ecuador. Its caipital is Portoviejo. The province is namit efter the Manabí fowk. Manabí's economy is based hivily on natural resources such as cacao, bananas, cotton, etc. Its industrial sector is based on Tuna cannin, tobacco, an alcoholic beverage production. Local productions include craftin o montecristi hats, an furnitur. The province is dividit intae 22 cantons. The follaein table leets each wi its population as o the 2001 census, its aurie in square kilometres (km²), an the name o the canton seat or caipital. Wikimedia Commons haes media relatit tae Province of Manabí. This page wis last eeditit on 10 Mairch 2018, at 23:06.